February sure was an interesting month with the DJIA setting all-time records on 65% of the possible trading days during the month. That's crazy. The S&P 500 climbed higher by 3.7% during hte month which helped to boost up the asset side of the net worth equation. Of course the $275 in dividends helped too. For the month our net worth increased $5,061.37. It's amazing what a little bit of income can do to flip things in your favor. As many of you know the calendar turning to February meant that I was heading back to work so our consistent cash draw finally came to an end now that paychecks are rolling in. Even after shelling out ~$7k for property taxes, ugh just typing that makes me cringe, we still improved our cash reserves and of course the markets' did their part to move our net worth into positive territory. For the month our net worth increased 1.08% and YTD we've shown a gain of 0.99%. As of the end of February we have 24.5% equity in our house based on our purchase price from 2013. However, according to Zillow our house has increased in value $22.3k from our purchase price which is a nice bonus, although I keep the purchase price as the value in the net worth equations. Based on Zillow's estimate the equity in our house is 31.5% due to the appreciation. During June's update I started including a % breakdown of our net worth with each monthly update. The assets are broken down into cash, taxable investments, tax advantaged investments (401k, Traditional & Roth IRAs), house (using our purchase price) and other which covers things like our cars and various collectibles from when I was a kid (they don't really move the needle at all). Since I write so much about investigating companies as an investment I figured it'd be fun to see how our balance sheet looks. As of the end of February our debt to equity ratio is 28% and our debt to total capitalization is 22%. Not bad, but I'd love to get that debt down to ZERO! Each month I like to examine the state of our non-work cash flow. Since our goal is to become financially independent that monthly cash flow has to come from somewhere. Truly passive income, dividends and interest, totaled $282.36 during February which barely eeked out a gain compared to November's $279.99. *Dividends are from my taxable accounts only. Adding in the EBIT earned from blogging/writing added another $176.39 to the monthly non-day job income total. Total non-day job income for February came to $458.75 which is about a 12% decrease from November. Yikes! Although I'm not too concerned since the actual passive income showed a gain. I mentioned in January's update that was setting a goal of reaching $10k in non-day job income with a stretch goal being hitting $11k. That's not a huge increase over 2016's $9.4k, but I don't expect much in the way of new investments until maybe Q4 of this year since we really need to focus on paying down some debt. Including dividends, interest and blogging income we've generated $990.53 of additional income through February. We're 9.9% of the way towards our goal of $10k, but March should go a long ways to getting us closer to that goal. 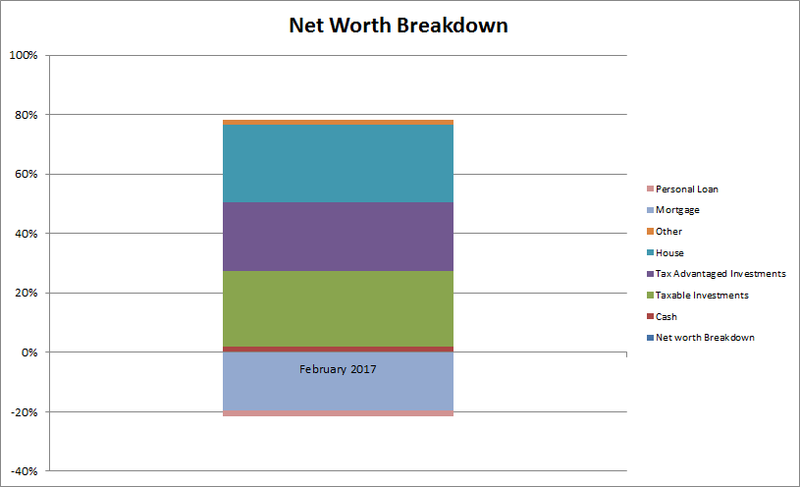 How did your net worth fare in February? Did you ride the markets higher or hit a bit of a speed bump? Nice way to make a comeback. We all knew it was only temporary until you went back to work. Now you can continue to see the growth of your net worth increase dramatically. Looking forward to your March review. All the best. Now that I'm back at work I should start having consistent gains to my net worth assuming the markets don't tank. It's great to be back and start having positive cash flow again. Nice move making on the net worth chart - I assume March is going to be a bit better than what you had in February, excited to read. Keep it up. My focus is on the cash flow, but I still want to get a bigger picture view by looking at our balance sheet. February was a good month especially since we had such a big hit due to our property taxes, but we're back on the right track again. Hi JC -- all the best earning some "active" income again! Nice to see that your net worth is climbing despite drawdowns... the market has been hot in February! 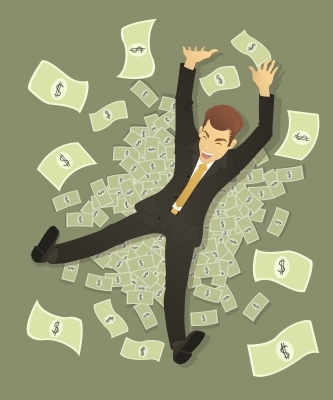 Of course I'd love for the passive income to cover everything we're not quite there yet so active income goes a long ways to improving things. I've been quite surprised to see that our net worth pretty much held it's own during the time I was out of work. Of course the market run higher sure helped with that. Love that you're calculating your net worth! I had never calculated mine before, but I might have to give it a try now! I think the bigger focus should be on the passive cash flow, but examining the balance sheet gives you an idea of what is truly at risk and also what you could liquidate everything for and what you would have left. Great work JC. Nice to see the net work climbing!